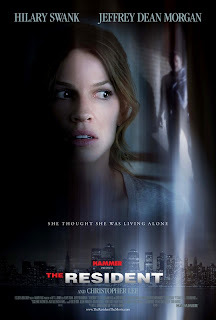 Juliet (Academy Award-winner Hilary Swank, Million Dollar Baby), a beautiful doctor, has found the perfect New York apartment to start a new life after separating from her husband. It’s got spacious rooms, a spectacular view, and a handy, handsome landlord. But there are secrets behind every wall and terror in every room as Juliet gets the unnerving feeling that she is not alone. She is being watched. She is being stalked. And no one is safe when she discovers the relentless horror on her doorstep. But how do you stop an evil that you can’t see…until it’s too late? Jeffrey Dean Morgan (Grey’s Anatomy) and screen legend Christopher Lee (The Lord of the Rings) costar in this pulse-pounding shocker from famed horror studio Hammer Films (Let Me In).